Don’t just sing Despacito without knowing the meaning. Learn the beautiful language with Spanish In A Hurry - from crash courses to full-fledged ones. If you don’t have much time to spare but want to learn Spanish, Spanish In A Hurry Is Just for you. Started by Mousumi Ghosh, pick from weekend sessions that get you familiar with the basics of the language in under six hours (Let’s Go Spanish, is what it’s called). She even has audio-visual techniques and smart tricks and tips, at these workshops so you can go back home and hone your new-found skills. Ideal if you’re travelling to Spanish speaking nations, or even if you’ve taken up the language at college. If you keep track of the Facebook page, you’ll find really fun and casual catch-ups called, Churros And Cafe Spanish, which is informal gatherings of people interested in learning the language. Plus, multiple workshops that take place every month. Some of them focus only on the language while others get you familiar with the culture of Spain, including food, festivals and of course, the language too. 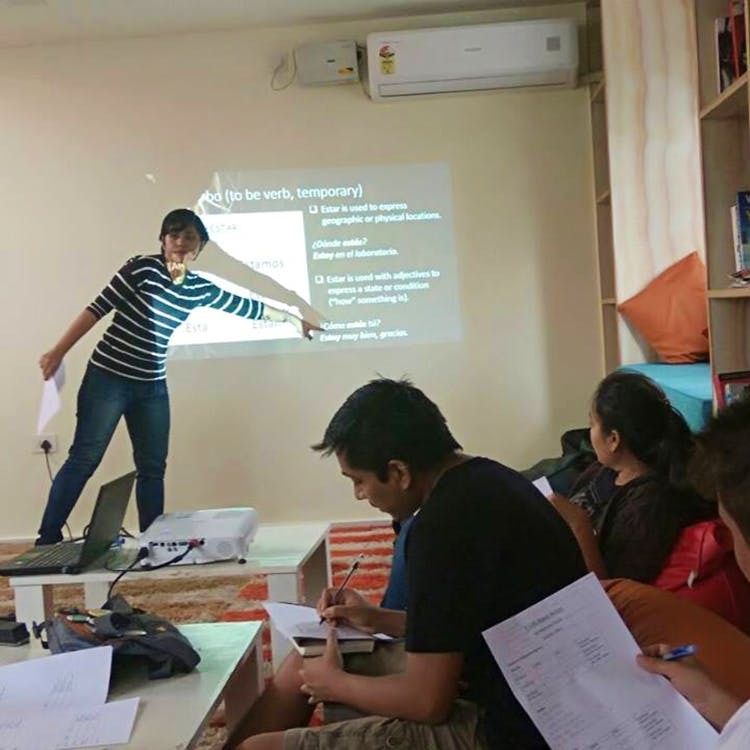 Want to learn the language through private classes, and more than just basic proficiency? Call Mousumi for these proper sessions. Starting with a regular A1 course that included free study material for exams, you get 40 hours with your trainer, for INR 10,000. As you progress to higher levels, the cost goes up too. Keep a check on Facebook for free workshops that are more fun, and functional. If you’re hitting up Spain, get to one of these. It’s fun, and you’ll be get by easily.